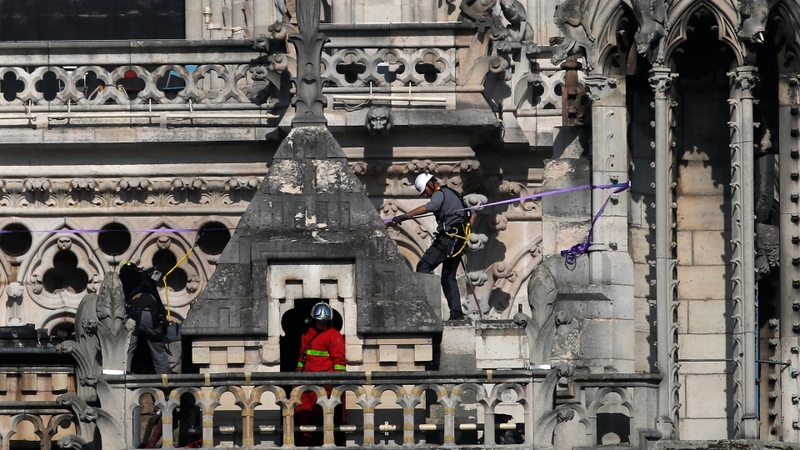 PARIS -- Bells of cathedrals across France rang in a moving tribute Wednesday to Notre Dame as firefighters and experts continued to keep the beloved but weakened landmark under close surveillance. Meanwhile, Notre Dame's rector said he would close the cathedral for up to “five to six years,” acknowledging that a segment of the structure may be gravely weakened. The firefighters acted aggressively to protect wooden supports in the twin medieval bell towers from the flames, averting a bigger catastrophe, said Jose Vaz de Matos, a fire expert with France's Culture Ministry. Paris Firefighters' spokesman Lt.-Col. Gabriel Plus said that even though they are in good condition, a “threat” continues to the gables, or support walls, because of the heavy stone statues perched on top of them. France's PM announces international architects' competition to rebuild the #NotreDame spire.